Cherish Each Precious Day: Mr. and Mrs. I thought Friday would never get here. It seems like such a long time since I've posted a project for Crafter's Companion. Thanks for your patience. My Mister has had some health issues,so I took the month of October to deal with appointments and such. He has some surgery in early December - hopefully, I'll be able to work around that. We were able to squeeze in a few days last week to drive to Va. and see our daughter and her family. We had a great visit - got to take our granddaughter to Disney on Ice! She was so enchanted with all of the beautiful princesses, lights, snowmen, etc. It was fun. this beautiful Cardstock...oh, and the die...oh, and I LOVE their Kraft cardstock! Sorry to hear about hubby! I loveeeeee your cards! GORGEOUS!!!!!!!!!!!!!! i agree... these are GORGEOUS! Yes, Patti, they ARE gorgeous! Love the die cut and all of the silver. We've had lots of weddings, too! Oh my LOVE this Mr and Mrs die - and such pretty bg paper you used. Talk about a snap to mass produce. Beautiful! I love the Mr and Mrs die. Very elegant. Sorry DH is under the weather. Glad you got to see the ice show. I'm jeleous. Your cards are so beautiful. Making more than one is a good idea. They will be treasured when you give them away. So elegant and beautiful. A great card for an anniversary or wedding. I love the papers you chose too! Oh wow, these are gorgeous cards Patti! Stunning cards! Doesn't it feel good to mass produce some to have in your stash? Hope your hubby does well with his surgery. That's no fun! You be sure to take care of you, too! 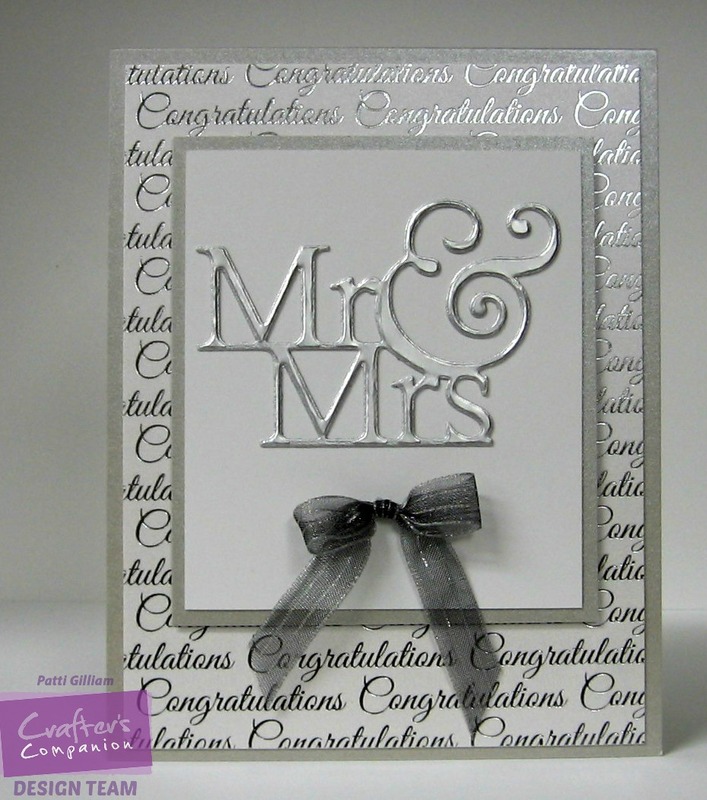 Gorgeous and elegant cards, the papers are beautiful and great die! I will keep your husband in my prayers. Oh, I hope your hubby is doing better! Sending prayers to your way! 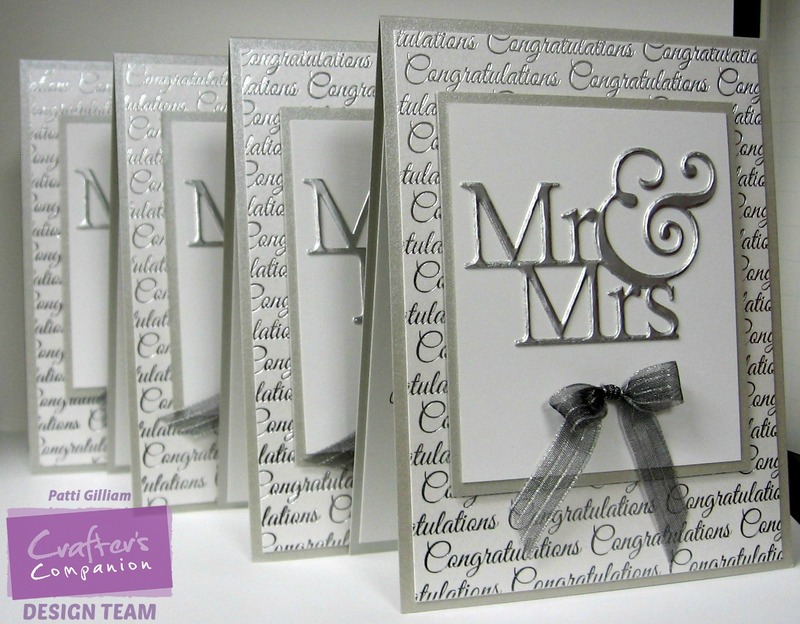 Lovely cards... so elegant with the silver. Beautiful card. Love the MR and MRS script. Oh, will keep you both in my prayers. Gorgeous card, love everything about it. The die looks amazing in the mirror card stock. Sorry to hear hubs needs surgery, thinking of you and keeping you in my prayers. How fun, that you got to take your Granddaughter to the ice show. Miss those days, our Granddaughter is in collage this year away, and our Grandson is 16 in high school. Enjoy those little ones, they grow up so fast. So elegant Patti! Silver never fails for a wedding card and you took it up a notch with this design! I know time is precious with the grand babies but if you need a stamping fix the next time you're in VA definitely let me know! :) TFS! Beautiful and elegant! Best wishes for your husband.